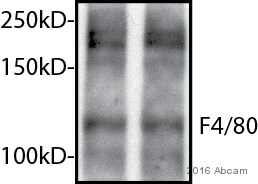 This antibody recognises the mouse F4/80 antigen, a 160kD glycoprotein expressed by murine macrophages. 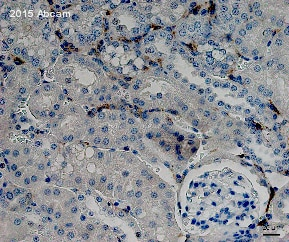 Abcam does not recommend this product for IHC-P.
WB: Mouse spleen and macrophages lysate. ICC/IF: Raw264.7 cells; Mouse bone marrow cells. IHC-Fr: Mouse spleen and intestine tissue. Flow Cyt: J774 cells and peritoneal macrophages. Please note we cannot guarantee IHC-P, however should you use this application for this product then please use a specific protocol which can be found in the protocols section of our datasheet here. Our Abpromise guarantee covers the use of ab6640 in the following tested applications. WB 1/1000. Use under non reducing condition. 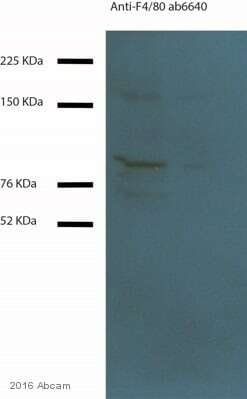 Detects a band of approximately 160 kDa (predicted molecular weight: 102 kDa). (predicted molecular weight of precursor protein: 102 kDa; protein is heavily glycosylated). Block in 5% milk for 1 hour. IHC-FoFr Use a concentration of 10 µg/ml. 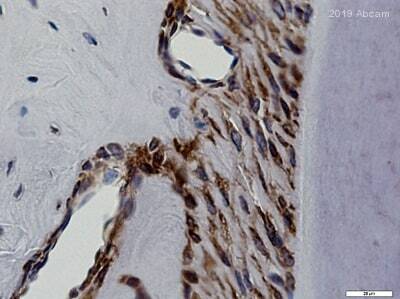 We recommend ab150165 Goat Anti-Rat IgG H&L (Alexa Fluor® 488) secondary antibody. 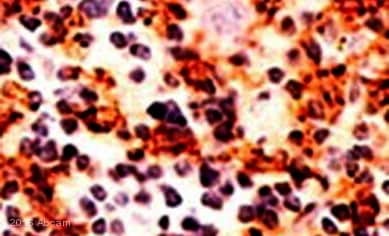 IHC-R Use a concentration of 10 µg/ml. Orphan receptor involved in cell adhesion and probably in cell-cell interactions specifically involving cells of the immune system. May play a role in regulatory T-cells (Treg) development. Expression is restricted to eosinophils. Belongs to the G-protein coupled receptor 2 family. Adhesion G-protein coupled receptor (ADGR) subfamily. ab6640 stained Raw 264.7 cells. The cells were 100% methanol fixed for 5 minutes at room temperatureand then incubated in 1%BSA / 10% normal Goat serum / 0.3M glycine in 0.1% PBS-Tween for 1hour at room temperature to permeabilise the cells and block non-specific protein-protein interactions. The cells were then incubated with the antibody (ab6640 at 5µg/ml) overnight at +4°C. The secondary antibody (pseudo-colored green) was ab150165 Goat Anti-Rat IgG H&L (Alexa Fluor® 488) preadsorbed used at a 1/1000 dilution for 1 hour at room temperature. Alexa Fluor® 594 WGA was used to label plasma membranes (pseudo-colored red) at a 1/200 dilution for 1hour at room temperature. DAPI was used to stain the cell nuclei (pseudo-colored blue) at a concentration of 1.43µM for 1hour at room temperature. ab6640 staining F4/80 in mouse spleen tissue sections by Immunohistochemistry (PFA perfusion fixed frozen sections). Tissue samples were fixed by perfusion with paraformaldehyde and blocked with 5% serum for 45 minutes at 21°C. The sample was incubated with primary antibody (1/100 in PBS + 5% FBS) at 4°C for 16 hours. An Alexa Fluor® 488-conjugated goat anti-rat IgG (H+L) polyclonal (1/200) was used as the secondary antibody. 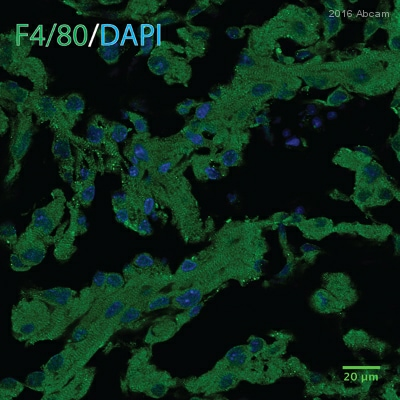 ab6640 staining F4/80 in mouse bone marrow cells by immunocytochemistry/ immunofluorescence. Cells were formaldehyde fixed and permeabilized in 0.2% Triton X-100 prior to blocking in 2% BSA for 30 minutes at 20°C. The primary antibody was diluted 1/200 and incubated with the sample for 9 hour at 4°C. Alexa fluor® 488 goat polyclonal to rat Ig, diluted 1/200, was used as the secondary antibody. Flow cytometry analysis of J774 cells labelling F4/80 (red) with ab6640 at a dilution of 1/10 followed by streptavidin FITC secondary at 1/100 dilution. The blue line shows J774 cells stained with Rat anti mouse isotype control. Flow cytometry analysis of peritoneal macrophages labelling F4/80 (red) with ab6640 at a dilution of 1/10. The blue line shows J774 cells stained with Rat anti mouse isotype control. 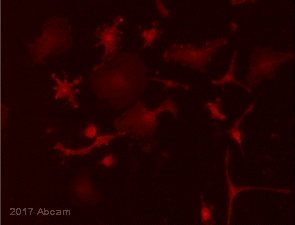 Flow cytometry analysis of J774 cells labelling F4/80 (red) with ab6640 at a dilution of 1/50 followed by goat anti rat IgG FITC secondary antibody at 1/100 dilution. The blue line shows J774 cells stained with Rat anti mouse isotype control. ab6640 staining F4/80 (red) in Mouse intestine tissue sections by Immunohistochemistry (IHC-Fr - frozen sections). Tissue was fixed with acetone and blocked with 10% serum for 1 hour at 21°C. Samples were incubated with primary antibody (1/10µg/ml in PBS + 10% serum) for 16 hours at 4°C. 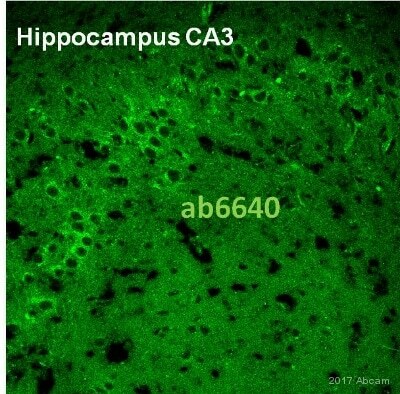 An Alexa Fluor® 555-conjugated Donkey anti-rat IgG polyclonal (1/1000) was used as the secondary antibody. Blue - nuclei. Publishing research using ab6640? Please let us know so that we can cite the reference in this datasheet.